Editor’s note: This is the second installment in a series looking at Virginia’s universities as economic engines. The University of Virginia, like most large universities, is well-known as an economic engine, providing tens of thousands of jobs and buying supplies on a massive scale to maintain its 1,600-acre campus and hundreds of academic and administrative buildings. The core of the university’s mission, however, is educating its 21,000 students. And U.Va. graduates, especially ones who become entrepreneurs, provide an often overlooked boost to the economy, thanks, at least in part, to the school’s training — especially at its graduate Darden School of Business and largely undergraduate McIntire School of Commerce. In fact, a recently released survey contends that U.Va. entrepreneurs have had a whopping impact, especially on Charlottesville’s economy and the state as a whole. The survey, conducted by professors from Darden and Stanford University, reports that, of more than 221,000 living U.Va. graduates, an estimated 60,000 have been involved in new business ventures, as founders, investors or early employees. The report projects that these alums have participated in the launch of about 65,000 companies employing 2.3 million people worldwide and generating revenues of $1.6 trillion annually. U.Va.’s entrepreneurs have created ventures that sparked the creation of an estimated 371,000 jobs in Virginia. The Virginia-based companies have produced about $395 billion in calculated annual revenues and spent $279 billion per year. “I was pleasantly surprised by the overall impact numbers,” says Michael Lenox, a Darden professor who is one of the survey’s authors. The others are Andrew King and Asif Mehedi from Darden and Charles Eesley from Stanford. Over the years, U.Va. entrepreneurs tended to start ventures in the Charlottesville area and in other Virginia cities. The survey showed, for example, that alumni launched 675 startups in the Charlottesville area, in part, Lenox theorizes, because of the social networks built there while the future entrepreneurs were students. Lenox also believes that people, including U.Va. graduates, are more inclined than ever before to start new ventures. “I think there’s an overall trend to be entrepreneurial,” he says. Two of the best-known U.Va. entrepreneurs are Tim Koogle, first CEO of Yahoo! Inc., who received a bachelor’s degree in mechanical engineering from the university, and the late Frank Batten, a 1950 graduate, who transformed Norfolk-based Landmark Communications Inc. into one of the leading media companies in the nation. His best-known innovation was the creation of the Weather Channel. Many studies have been done on the overall impact universities traditionally have had on local and state economies. The best-known impact is job creation. Timothy Hulbert, the president of the Charlottesville Regional Chamber of Commerce, says U.Va. represents “the two largest employers here.” He is describing two wings of the university: the massive U.Va. health system, which includes its medical center; and the academic side of the university, which includes faculty members and staff. The combined workforce numbers about 20,000 people in the Charlottesville region. “There is no question that U.Va. is the most powerful economic engine of greater Charlottesville. Period,” says Hulbert. A 2013 update of the impact U.Va. has on the economy showed that the school spent $1.39 billion on wages, $747 million buying goods and services and $294 million for capital purchases during the fiscal year 2011 — the most recent data available. Full-time students were estimated to have spent $239.2 million, and student visitors spent $18.2 million on goods and services during that year. Total spending for the year comes in at roughly $2.8 billion. The state annually gives U.Va. about $154 million to operate — about 10 percent of its academic division budget of $1.46 billion. Those graduates also tend to create cultural amenities such as theater and arts, says Rephann. “That makes the community attractive” and in turn draws more businesses. Money also pours into U.Va. from federal and foundation research grants, bringing more economic stimulus to Virginia. The school receives some $300 million in research grants annually, but the multiplier effect can be as much as five-fold if job creation and supply chain purchases are taken into account, he said. “The taxpayers’ money goes back to the early stages of knowledge creation which is what we do at the university,” says Skalak. That’s necessary in part because big companies — pressured now for short-term profits by stockholders — no longer finance early-stage ventures. “Thirty years ago Bell Labs’ leadership could parcel out revenue,” says Skalak. The research money ultimately results in new businesses, which create jobs and products. “The major benefit is in providing new knowledge-based ventures. In just the past year, U.Va. has spun out five startup companies, Skalak says. One example is Neoantigenics, which is developing therapeutic and diagnostic products for the treatment of cancer. The company has entered into a partnership with Pfizer and has received seed funding from the giant drug company. Another startup is HemoShear, a Charlottesville-based company which creates biological systems that more accurately represent human response to new drugs. U.Va. has a strong “proof-of-concept program” that includes private foundations like the Ivy Foundation and the Wallace H. Coulter Translational Research Partnerships, which give U.Va. researchers the opportunity to submit business concepts for seed funding, says Skalak. The $24 million U.Va.-Coulter Translational Partnership has invested about $1 million annually since 2006 — usually in amounts of around $100,000 — in early-stage funding for U.Va.’s most promising biomedical research. It has received a 7-to-1 return on investment, a number that attracted the attention of other schools, says Skalak. “In the early stages of research we’re finding talent and ideas that we’re not seeing anyplace else,” he says. 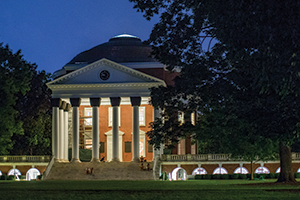 The survey of University of Virginia alumni was developed to take a snapshot of the entrepreneurial activities of the more than 221,000 living alums. Of that number, 135,227 alumni agreed to be contacted by the university via the anonymous online and mail survey. The survey elicited 22,757 valid responses, or 16.8 percent of those surveyed. The number of valid responses represents about 10 percent of the entire university alumni population. The survey asked for information on the respondents’ education and career development, details of their entrepreneurial ventures and demographical questions such as age, race and location of their businesses. The study’s authors analyzed the data and developed models to “carefully extrapolate” the alumni impact through entrepreneurial action. They said scaling factors yielded the estimates in the report, with those factors hinging on assumptions that the levels of entrepreneurial activities were similar between those who responded and those who didn’t and that respondents included information about all their entrepreneurial ventures. The survey’s methods are similar to studies done at Stanford University and the Massachusetts Institute of Technology (MIT).